Offering luxury transportation from South Florida, we specialize in corporate and executive travel in our new Mercedes Sprinters. Holds 14 passengers with plenty of luggage storage. 3 hrs packages starting at $250.00. Also Point to Point Services available, please contact us for pricing. Professional drivers who are fully uniformed and licensed. Vehicles that are insured and approved by all counties and state. Ride to service ports, airports and counties - with service for all of Florida. 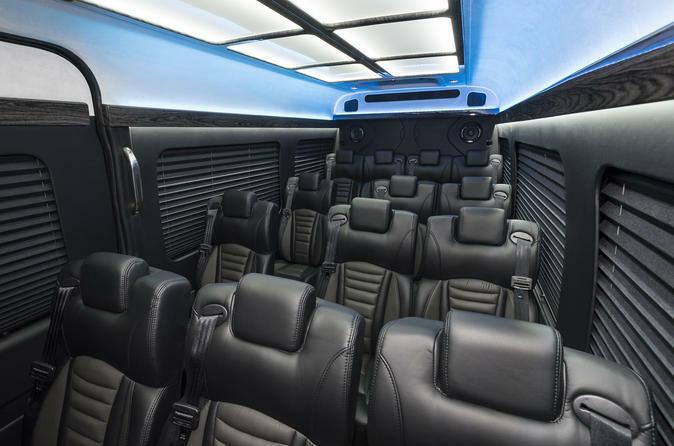 Vehicles are equipped with, leather captain chairs, wood floors, high end sound system, WIFI, Smart TV, DVD, Apple TV, HDMI connection, cell phone charger ports, 110v plug in and much more. Offered is point to point service, hourly service, nights out, group tours, or just a ride around. Wood floors, Smart Tv, Hi end sound system, Dvd, BT, Wifi, Hdmi, Ice cold AC, reclining Leather Captain Chairs, Rgb Lighting, and much more! Started out to change the industry with honesty, fun, and safe luxury transportation, and to have a company with full integrity. Fully licensed and insured Sprinters are equipped with WIFI, Bluetooth, Apple TV, high end sound system, wood floors, reclining leather captain chairs, Maybach ceiling and lighting, aux connections, 110v and 12v throughout, HDMI connection, large ice cooler, A/C, and RGB (red, green, and blue) disco lighting.